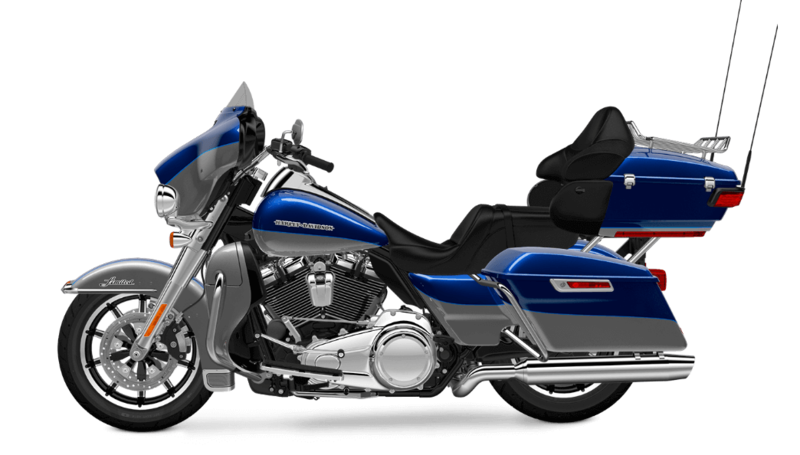 The Harley-Davidson® Ultra Limited Low is an ideal bike for any rider in Overland Park looking for a fully equipped touring machine ready to take on the longest rides. Like the rest of the latest Harley-Davidson® touring lineup, it receives the all-new Milwaukee-EightTM engine, as well plenty of smart features, and distinctive styling details. The Ultra Limited Low is also one of the lowest bikes on the road, so it’s perfect for smaller riders or anyone who appreciates a low seat height. 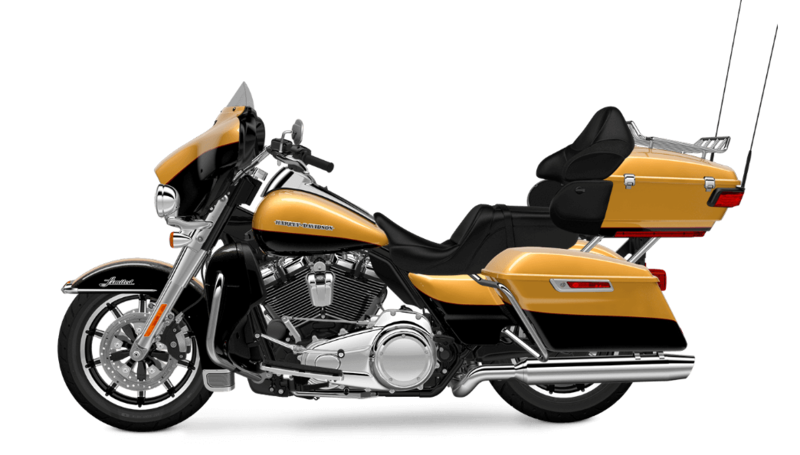 Check it out at Rawhide Harley-Davidson®, just a short drive from Lenexa, KS. The Ultra Limited Low is packed with the kind of touring features you want from a premium ride designed for long miles. 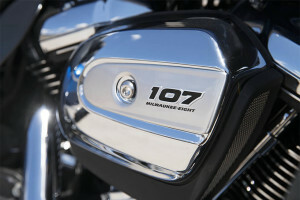 All-New Milwaukee-EightTM 107 Engine: This completely new engine is better than its predecessors in every way. The Milwaukee-EightTM pumps out more power, burns less gas, runs cooler and smoother, and even delivers a crystal clear exhaust note. It even pumps out more charging power to keep your devices one when you need them most. Overview Milwaukee-EightTM 107 Engine: Start with the tried and true V-Twin, add a bit of displacement, stir in a higher compression ratio, shake with four valves and dual spark plugs, and you’ve got a strong engine that delivers more power and more efficiency. Add in a counter-balancer, new cooling and exhaust systems, and you get an all new engine that runs smoother and cooler than ever. Steering Head and Forks: 49mm fork legs are 18 percent larger for improvement in stability and confidence in corners, and the dampers are tuned to provide comfort. Ergonomically Designed Hand Controls: These controls are designed so your hands will always be in the right place for superior comfort and control. Reflex Linked Brakes with ABS: You don’t ever want to worry about having enough braking power, and with linked Brembo® brakes and an anti-lock brake system, you know you’ve got the stopping power you need. Air Adjustable Suspension: Set up your suspension how you want. It’s easy to adapt to different loads and different road surfaces with the tool-free adjustment feature on the Ultra Limited Low. 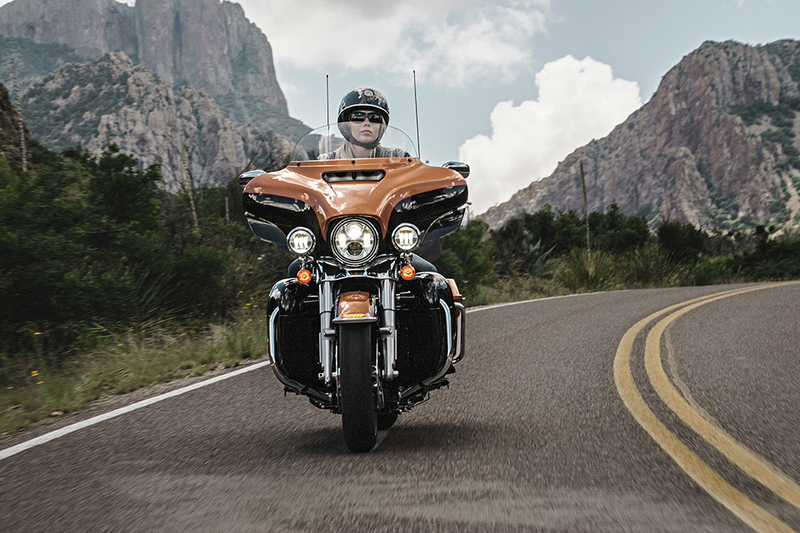 H-D® Smart Security System: With a wireless security system installed from the factory, you know you can rest easy when you walk away from the bike. It’s automatically protected thanks to a state-of-the-art wireless keyfob. 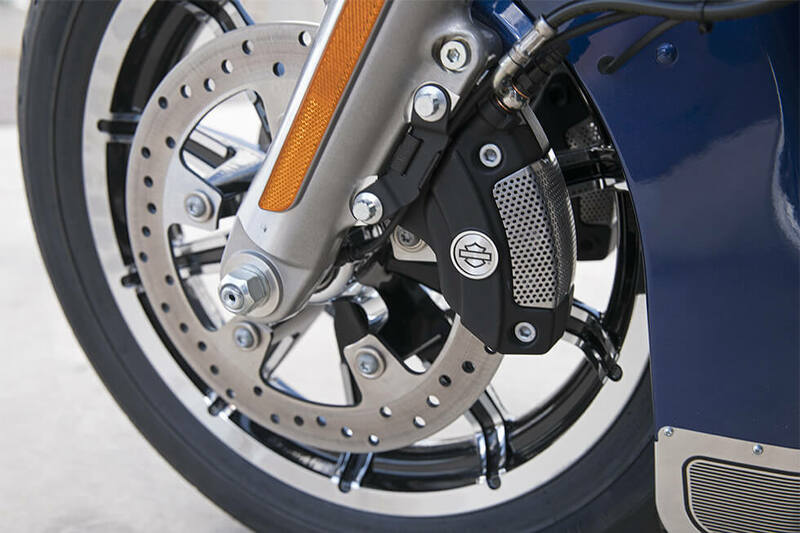 Brembo® Brakes: You’ve got two rotors and calipers up front and a single set out back, so you know you’ve got the power to slow down when necessary even while loaded up with gear. Lowered Suspension: The Ultra Limited Low is an inch lower than the Ultra Limited, making it easier to climb on and off. It’s even easier to put your foot down at the stoplight. Dunlop® Multi-TreadTM Tires: These tires provide a hard-wearing compound in the center and a compound with higher grip on the sides to improve handling. DaymakerTM LED Headlamp and LED Fog Lamp: At 2,136 lumens, the DaymakerTM front LED headlights are bright enough to rival the sun, ensuring you never have to worry about riding in the dark. Six-Speed Cruise Drive® Transmission: With six gears, you’ve got the perfect ratio to maximize the capability of the big v-twin. You’ve also got a tall top gear for smooth, quiet highway cruising. H-D® Smart Security System: You can rest easy knowing that your ride is protected by smart security system. A wireless keyfob makes it automatically activate when you step away from your bike, then deactivate when you come back. The latest high tech features are standard with the Ultra Limited Low. That includes smartphone integration, entertainment options, and much more. 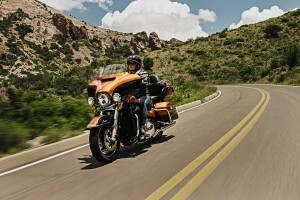 Exclusive Infotainment: With the latest infotainment system from Harley-Davidson®, you’ve got access to smartphone connectivity, navigation, music, and more. Jukebox with USB: Plug in your smartphone or other device and enjoy easy charging and playback. Voice Recognition and Bluetooth: You can control your infotainment system with integrated voice commands and even sync up your smartphone via Bluetooth connectivity. 5.25-inch Front and Rear Speakers: You’ve got four speakers delivering plenty of volume for both front and rear passengers. Voice Recognition and Bluetooth: Allowing you to focus on the road and still take advantage of your infotainment system, the Ultra Limited Low comes with voice recognition and handsfree phone systems. 6.5-Inch Color Touchscreen: This big, bold display gives you modern graphics, easy to use controls, and access to all the features present in the infotainment system. The Boom!TM Box 6.5GT Radio: This smart infotainment system pumps out 75 watts per channel at only 1% distortion, and it includes a factory tuned equalizer and a speed sensitive volume feature. Ready for Upgrades: Want more? Satellite radio, weather and traffic services, and more can be added to your infotainment system. 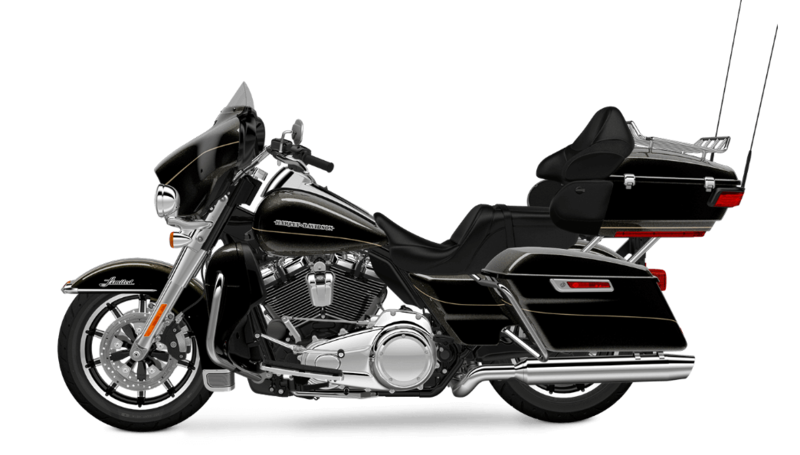 The Ultra Limited Low has that super premium feel that you only get from a well-equipped Harley-Davidson® touring bike. Full Length Floor Boards and Heel/Toe Gear Shifts: These are designed to provide the riding position you want, and they feature isolated rubber pads to cut out road vibration and keep you comfortable. Fairing Design: The batwing fairing used on the Ultra Limited Low is the result of thousands of miles of real world testing, along with thousands of hours of wind tunnel and computer testing. 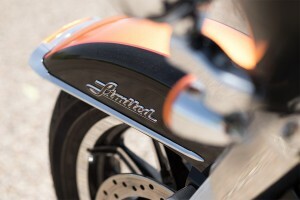 The result is a fairing that reduces head buffeting to keep you more comfortable. Tour-Pak® Luggage Carrier: This smartly designed luggage carrier is spacious, weather proof, and secure, and it’s capable of holding up to two full face helmets. What more could you want? 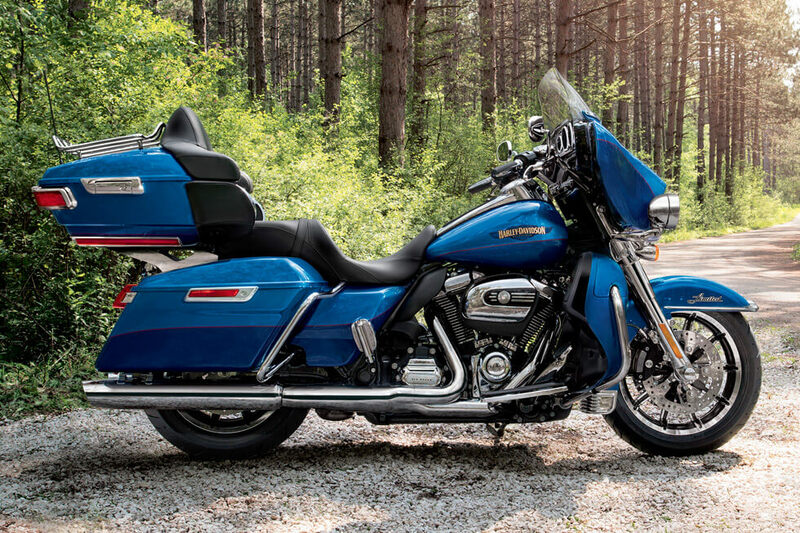 Saddlebag Design: When it comes to carrying capacity, the Ultra Limited Low has you covered. These sleek, locking, weather-proof saddlebags are bigger than ever, allowing you to bring everything you need along for the ride. 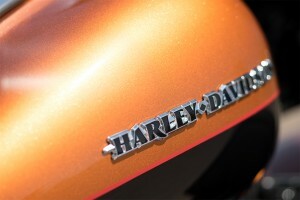 Battery Charging Harness: You know you’d add one if it wasn’t standard, so Harley-Davidson® has saved you the trouble. Handlebar Position and Grips: The Ultra Limited Low features reduced diameter grips to help you handle the brakes and clutch. The bars also offer a generous sweep for lower reach and added comfort. Reduced Width Housing and Derby Cover: The body of the Ultra Limited Low is narrower than the standard Ultra Limited to help smaller riders put both feet flat on the ground. 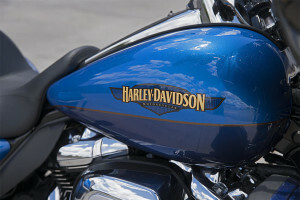 Windscreen: To help reduce head buffeting, the windscreen on the Ultra Limited Low is smaller. That might seem counterintuitive, but it works by reducing the vacuum created by a larger windscreen. Wide Set Handlebar: A nice wide bar puts your hands in a more natural position, so it’s easier to ride in a confident, relaxed posture. 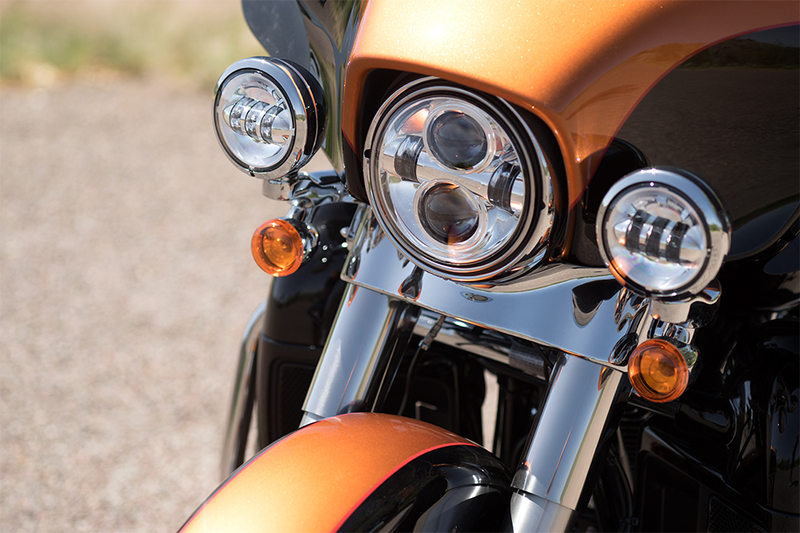 One-Touch Design Philosophy: Harley-Davidson® makes everything as simple as possible, and if it can be accomplished with a single touch, that’s how it’s made. 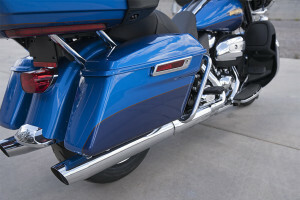 That applies to the saddlebags, luggage carrier, and fuel door. Passenger Seat Space and Leg Room: The Ultra Limited Low now gets more space for rear passengers, with more leg room and seat room. Fairing Lowers: Just like the batwing fairing up top, the lower fairings provide good coverage and well-designed aerodynamics to direct wind around you. Passenger Footboard Mounts: A passenger should feel confident and comfortable, and the standard footboards are there to help. They can just as easily fold up to stay out of the way. Back and Arm Rests: These supportive features help keep back seat passengers comfortable. That’s good for everyone. Heated Hand Grips: The Ultra Limited Low come with heated handgrips, a rare standard feature, to help keep you comfortable on the coldest days and nights. 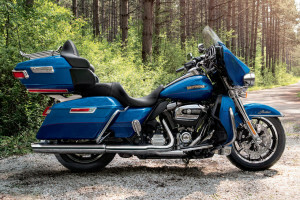 Cruise Control: On a bike designed for long-haul highway rides, cruise control is a necessity you don’t want to go without. The Ultra Limited Low looks just as good as it performs. There are plenty of highlights that add up to an iconic, modern day ride. Gloss Black Inner Fairing Design: The back side of the fairing is finished in a premium gloss black. That means you can focus on the big infotainment screen, the large gauges, and the easily handled controls. 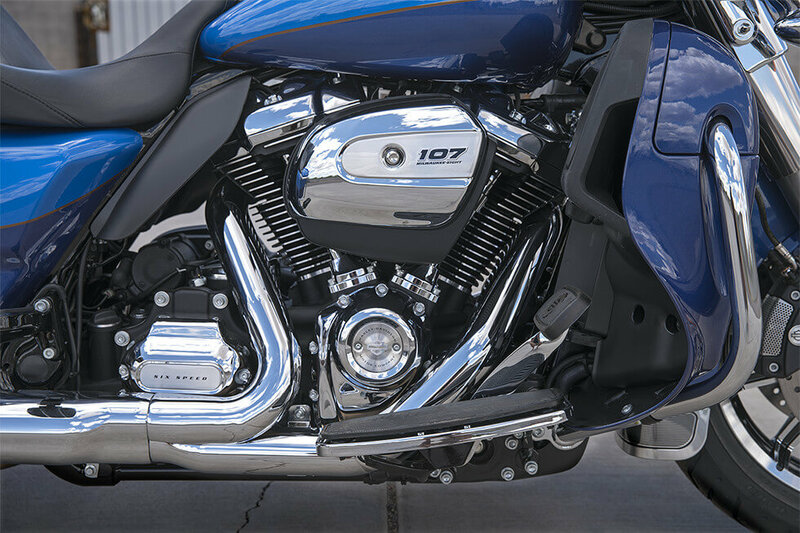 High Flow Airbox: That big chrome piece on the side does double duty as a visual focal point and as the point where air enters the engine. 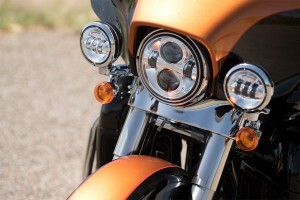 Bullet Turn Signals: The chrome bullet turn signals may be completely classic, but with the latest lighting technology they’re also super bright and visible to anyone on the road. 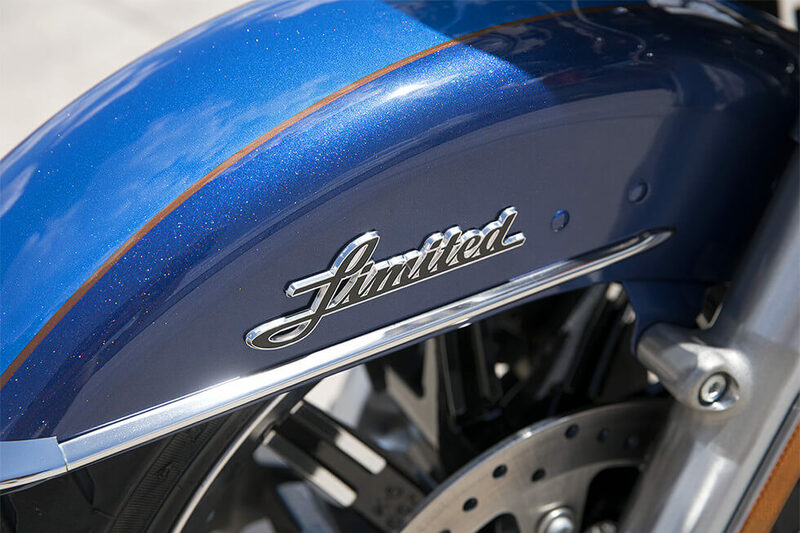 Fairing and Fender: The fairing and fenders of the Ultra Limited Low make it a modern classic, with flowing lines, chrome accents, and functional design. Impeller® Wheels: These bright machined and black finished wheels stand out even on a bike a brilliant as the Ultra Limited Low. Classic Fuel Tank: With six gallons of fuel, you can hit the open road for long journeys. The tank doubles as a large canvas for the premium paint and badging. Pure Harley-Davidson® Styling: The Milwaukee-EightTM might be all new, but the style is pure classic Harley-Davidson® chrome, black powder-coating, and machined finishes. This is unmistakably an air-cooled Harley-Davidson® V-Twin. 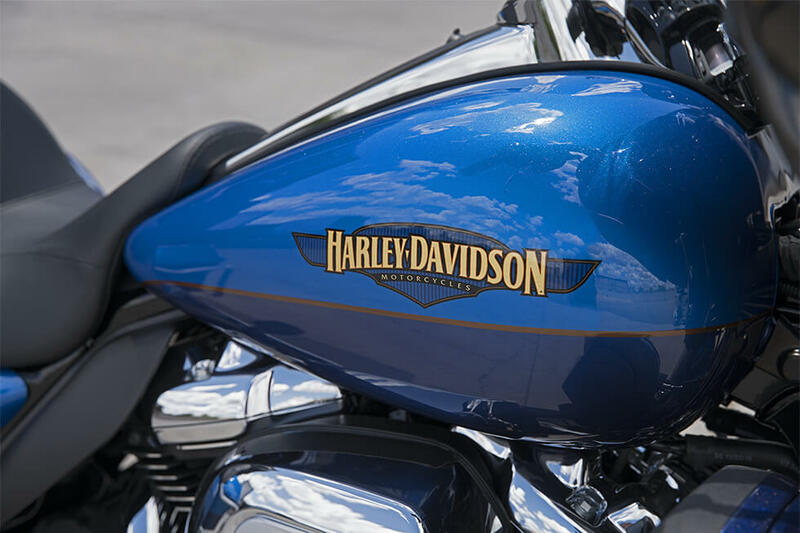 Tank and Fender Badges: Beautifully stylized chrome and black badges make sure that anybody who looks at your ride will know exactly who made it.